In the words of Bob Dylan, “The times they sure are changin’.” A generation ago, when people headed into the woods they carried a map and a compass for navigation and matches in case of emergency to start a fire. 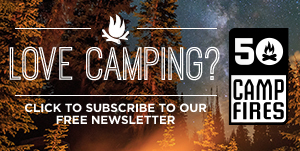 Nowadays, many campers won’t leave their vehicle without their smartphone, tablet and video camera. These great tools have their benefits as long as they have power. Losing battery juice on your phone during a run on Candy Crush is annoying, but relying on your phone’s GPS with limited battery can be a dangerous situation. 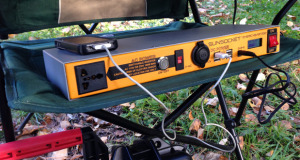 This is where portable solar chargers can become your best friend while camping. 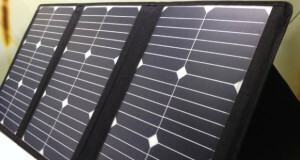 With the advances in solar technology both products and prices have been shrinking. Manufacturers today are producing affordable, functional, portable solar chargers to make life easier outdoors. Yes, we are a little spoiled. On your next camping trip, come prepared and completely energized with these fantastic portable solar chargers for your pack, your pocket and your campsite. 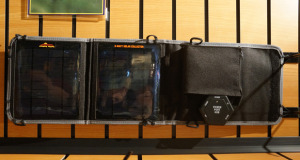 The Birksun Elevate is a lightweight backpack that charges up with the power of the sun or by plugging into the wall. Equipped with a front organization pocket, fleece tablet sleeve and hydration-pack pouch the Birksun Elevate helps you carry all your gear without weighing you down. Design goes a long way with this backpack as it’s both functional and stylish. The front solar panel can boost your smartphone battery about 25% with just one hour in the sun. The backpack is very durable and built to last for years. We thinks it’s great for bikers, avid hikers and just about anyone who is in need of a power supply that is always with them. 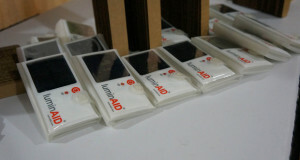 The LuminAid inflatable light is an incredible solar-rechargeable light. It is a very compact and packs nearly flat. It inflates within seconds to become a lightweight portable light. 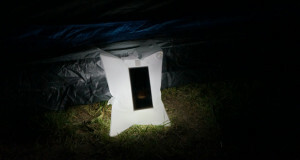 The LuminAid gives out a nice soft light perfect for hanging in your tent. Around the campsite the LuminAid will come in handy, from finding items in your cooler to making your way to the bathroom. 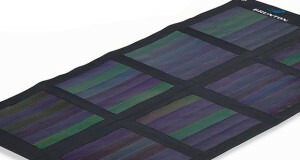 It only needs about 5-7 hours of sunlight charge time to create 17 hours of light. Also perfect for emergency situations the LuminAid can hold it’s sun-powered charge for over four months making it a reliable emergency lighting option. The Eton Raptor is your all-terrain, all-in-one gadget to keep you in touch, in power and on the right path. Charge your phone with the 1800 mAh internal battery or play tunes from your phone to the speaker. 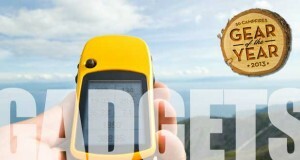 This splash-proof gadget has too many features to name all of them, but here are a few: monocrystal solar panel, altimeter, barometer, thermometer, chronograph, NOAA weather radio, AM/FM radio, Digital compass and flash light. It even comes with an aluminum carabineer to attach this gem to a backpack. Goal Zero has been a leader in portable power for a long time and the cutting edge Guide 10 Plus Kit is no different. 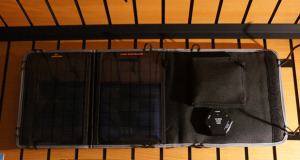 This kit is a 2 for 1 power supply with the Guide 10 Plus Recharger and Nomad 7 Solar Panel. Charge the solar panel with the power of the sun or USB in to a power source. From there the panel can output its power to AA/AAA batteries or USB port. This kit lets you charge batteries for devices that don’t use USB. The Snow Lizard SLXtreme 5 is the World’s only waterproof, rugged, battery boosting iPhone 5 case. This case is made out of polycarbonate and will definitely withstand bumps or drops from 6 feet high. It is visually appealing and comes with a quick release latch making it easy to slide your phone in and out of the case. The Snow Lizard SLXtreme case comes equipped with a 2,000 mAh battery that will double the life of your phone and a whopping 360 hours of standby time. You can transfer that power to other handheld electronics with the USB cord that is included. For emergencies, one hour in the sun offers 10 minutes of talk time. If you need light at your campsite or in an emergency situation you don’t want to rely on batteries. The Goal Zero Torch 250 Flashlight, has you covered. It not only charges from the sun but doubles as a flashlight. Equipped with a flashlight, flood light or red emergency light for any situation. Full bright and half bright modes helps you conserve power for when you need it most. The flashlight easily charges up from the sun, USB wall charger or the attached hand crank. It can also serve as a power source for other hand-held devices via USB. If you’re going the hand cranking route, about one minute cranking produces two minutes of light. So not ideal, but in a bad situation it could be a life saver. The LightCap 200 cap turns your ordinary bottle of water into a lantern luminating with functional light. This handy device doubles as a flashlight. Light sensors turn it off during daylight hours to charge, so that means no wasted light if you forgot to turn it off manually. 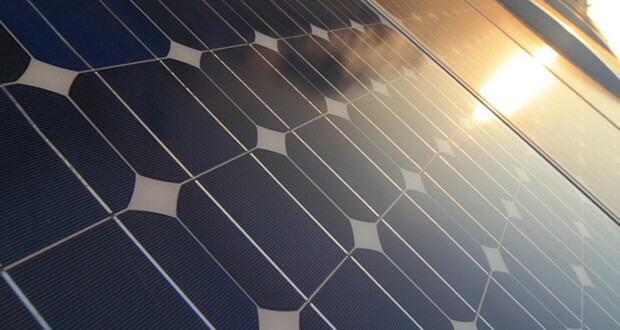 Approximately two hours of direct sunlight will power one hour of operation; 12 hours of direct sun will fully charge the battery providing more than 8 hours of light. A lot of power for something that simply caps your water bottle. Your phone is your lifeline nowadays and keeping it charged when outdoors is difficult. This EnerPlex Surfr iPhone case doubles your smartphones battery power with 2000 mAh capacity attached. The phone also features a solar panel on the back of the case for emergency charges. It does a great job of trickle charging your phone with the solar panel. This charger is light weight and doesn’t add much bulk to the phone, but still protects your phone from the elements of camping. If you want one less thing to worry about and more time focusing on enjoying the outdoors, this phone is a great option. Turn your campsite into a party with the Eton Rukus XL eight speaker system that boasts 22 watts of power. This device lets you rock out while charging your phone at the same time. The solar-powered stereo will keep your party going 8 hours after the sun goes down with the internal lithium ion battery. Bluetooth technology lets you enjoy music without the limitation of cords. Turn on the bass boost button for that extra kick. 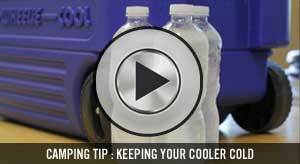 The Grape Solar Glacier is an excellent refrigerator/freezer for disaster preparedness or vehicle based applications. Fitting almost anywhere due to its ergonomic design makes this a great camping option. The Glacier 3.7 works with solar-powered generators in addition to DC/AC power sources to operate without electricity. With some amazing technology this fridge/freezer, functions just like the fridge at home with the freezer cooling down to 5 degrees Fahrenheit. If you’re headed out for a week of car camping, this refrigerator/freezer can replace your cooler and all that annoying ice. 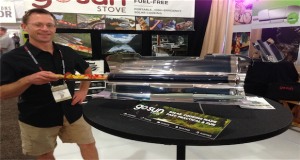 The GoSun Stove, allows you to bake, broil or fry any meal with the power of the sun. Harnessing the power and heat of the suns rays it only takes 20 minutes to prepare a meal and can roast up to seven pounds at a time by reaching up to 700 degrees. Now that is fast. This solar-powered stove is so easy-to-use and safe to touch, even when its blazing hot. Don’t let cloudy days scare you. The GoSun Stove works essentially like a thermos keeping your food warm until it finishes cooking with no fuel at all. The design looks futuristic and we think this may just be the wave of the future. The Lighthouse 250 lantern offers unplugged power that’s perfect for camping. This small light-weight lantern has a collapsible stand and USB cord for charging your phone or other electronic devices. It easily wraps up around the base of the lantern keeping the unit very compact. The Lighthouse 250 Lantern recharges quickly from USB, solar panel or the included hand crank. It also has a built-in USB port to power small handheld devices. The duaLite directional lighting feature helps you conserve power for extended run time. No light is wasted in this lantern! The Lighthouse will run for 24 hours on low to help you get through the weekend outdoors safely.